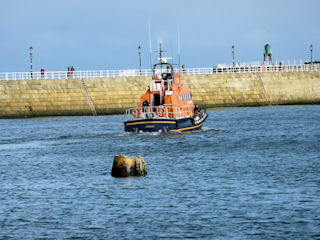 On the 14th October 2010, the Royal National Lifeboat Institution offshore relief lifeboat Corinne Whitely left Whitby this morning on route for a refit in at Ballyhack in Waterford, Southern Ireland. Three of the Whitby Lifeboat crew were on board for the journey which was expected to take seven days. The first leg is from Whitby to Aberdeen and on day two they planned to continue up the coast to Inverness. This was to be followed by two days travel along the Caledonian canal, with a four day passage to Oban. Day five saw the boat travel down the West Coast of Scotland to Stranraer with the lifeboat crossing the Irish Sea to Dun Laoghaire. The final day would see the boat journeying down the South East Coast of Southern Ireland to the RNLI Lifeboat Station at Dunmore East in Waterford. The relief lifeboat Corinne Whitely leaving Whitby bound for Ireland in Occtober with three of the Whitby Lifeboat crew onbaord.